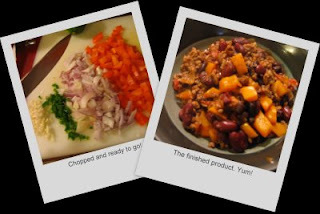 Chili is one of the dishes that you can customize based on what you have on hand or who you are serving. I used ground beef, but you could easily use ground turkey, ground tofu, or just extra veggies. The method is the same for whatever ingredients you decide to throw in. This version had kidney beans, black beans, garlic, jalapeno, orange pepper, and red onions. For seasoning I used some salt, pepper, cilantro, chili powder, cumin, and a little green Tabasco sauce. The basic cooking method is to heat oil in a soup pot and then sweat the veggies until they are soft. Then toss in the drained beans, canned tomatoes, and ground meat if you are using it. Bring it to a boil and then turn down to a simmer. Stir in the spices and then just keep warm until you are ready to eat. Easy and tasty! On the side, I made a quick cornbread according to the recipe on the cornmeal container. It was pretty bland for my taste - it needed some extra salt. I put some honey on and sprinkled it with salt and it tasted fine. The whole meal takes about 30 minutes - you can cook the chili while the cornbread is in the oven.